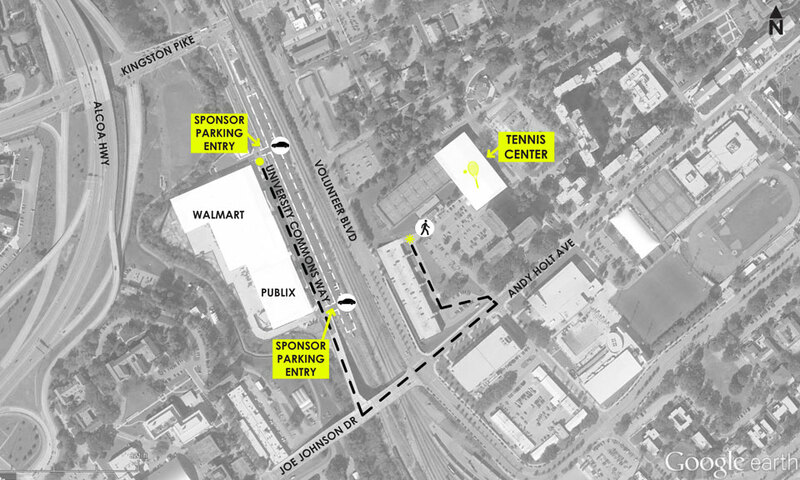 A free, designated sponsor parking area is located across from the Publix Supermarket on University Commons Way. A complimentary, direct shuttle service will provide quick transportation to the Goodfriend Indoor Tennis Center. To expedite entry into the sponsor parking area, please remember to bring your daily sponsor parking pass. Please note, you will not be denied entry if you do not have it; these have been issued as a convenience. Directions to the Goodfriend Indoor Tennis Center from West Knoxville via Kingston Pk. and Neyland Dr.
Head east on Kingston Pk. toward Neyland Dr. Turn right onto Neyland Dr. Turn left onto Joe Johnson Dr.
Continue straight onto Andy Holt Ave. Directions to Sponsor Parking from West Knoxville via Kingston Pk. and Neyland Dr.